This week’s parsha is Parshas Yisro—obviously one of the central parshiyos of the Torah—the parsha of kabbolas haTorah. The Torah says that three months after Klal Yisroel left Egypt, they come to Midbor Sinai. But then it goes back and says they travelled from Refidim and came to Midbor Sinai. Why? Rashi explains that just like they arrived in Midbor Sinai with teshuvoh, they left Refidim with teshuvoh. What did they have to do teshuvoh for in Refidim? They weakened their involvement in learning Torah. “Rofu yodeihem midivrei Torah”. Klal Yisroel just experienced an unbelievable gilui shechinoh at kriyas yam suf. There is a rule about gilui shechinoh—the higher one’s level in ruchniyus, the more intense the experience of communication you have with Hashem and the spiritual realm. The more easily you can detach yourself from your physical reality and recognize that you are a spiritual being, the greater your attachment to the spiritual realm can be. The year in Egypt was filled with the realization that there is a spiritual reality which is more real than the physical one. So, on the night of makkas bechoros, they could perceive the gilui shechinoh on one basic level. At kriyas yam suf they reach a higher level—even the smallest of them had a greater level of nevuoh than Yechezkel Hanovi. Then they have to solidify these levels before they reach the final level at kabbolas haTorah. So Moshe Rabbeinu made a takonoh so that they would not go three days without limud Torah. But not everyone appreciates how vital learning Torah is and how necessary it is to maintain one’s spiritual growth. So they slip in their resolve and Amoleik is at the doorstep. Moshe Rabbeinu tells Klal Yisroel that they need to fight a battle in the physical realm, but the real battle happens in Heaven. The cause for Amoleik’s attack came from Heaven seeing a failure in ruchniyus, so the remedy has to be a reconnection to ruchniyus and to obligate one’s self to “Avihem She’bashomayim.” The Mishnah in Rosh Hashonoh says that the purpose of the lifting of Moshe Rabbeinu’s hands was to say that the battle was in Heaven and they should accept that fact. After seeing how much their physical situation is dependent on their level in ruchniyus, Klal Yisroel get a hisorerus to do teshuvoh. So they left Refidim in teshuvoh. As we continue growing in our levels, we solidify it with limud Torah. So Rashi says they came to Sinai with that same understanding that the only way to solidify growth in ruchniyus is with Torah. Then Klal Yisroel came to face the mountain. It implies that they turned their back on the rest of the world. From now on, for the rest of history, the focus of our lives will be what will occur on this mountain. Hashem tells us that first of all, He wiped out Egypt for our sake. He cares for us and brought us all together in Ramses from all over the country to leave. Hashem couldn’t wait for everyone to make their way naturally to the point of departure from Egypt. He was so anxious to start Klal Yisroel on their journey to kabbolas haTorah and make the bris. But before He actually gave us the Torah, He tried to make us understand: Why is He giving us the Torah? Just to complain that it doesn’t suit our tastes and our personality? To argue with its logic and quarrel that it makes no sense? The kabboloh is the hardest part. After that, once we make peace with the fact that Hashem is the ultimate authority in every area of our lives, the rest is easy. If you come to Torah with your own demands and your own vision of how to live life, the Torah will become very problematic and cumbersome. But if you give yourself up to the will of Hashem and decide that receiving Hashem’s instructions is the most edifying and inspiring thing imaginable, then it will be easy and very pleasant to obey. But it needs a certain attitude of acceptance and privilege. Coming to yeshivah to learn full time is the same thing. It may be a little rough in the beginning— to learn three sedorim a day when you aren’t used to it. But if you make a decision to succeed and you apply maximum effort, it becomes easier and easier and eventually, very enjoyable. The second thing Hashem tells Klal Yisroel is that kabbolas haTorah is a bris—a contract between two sides which obligates each side in their commitments. We are all signatories of this contract—not just our ancestors. It is our personal bris in each generation. As a result, we become the most treasured nation of the entire world. This is Hashem’s side of the bargain. Our commitment was to be a mamleches kohanim ve’goy kodosh. The mitzvos are the details—the means. But the goal is to achieve this level. That’s our ultimate objective. Hashem will protect us as someone protects his most precious treasure. It is not an easy deal, but we accepted it. We said “na’aseh”. Moshe went back to Hashem to convey our acceptance. How are we going to finalize the deal? The Rambam writes that what follows is the foundation of our belief that the Torah is the word of Hashem. All of Klal Yisroel had to be raised to a level of nevuoh right under Moshe Rabbeinu. We had to know from our own faculties of nevuoh that Hashem communicated directly without any filter to Moshe without any loss of physical function. No other novi before Moshe or after was able to communicate with Hashem on that level. Klal Yisroel saw that this was happening with absolute clarity. They overheard Hashem telling Moshe what to command us in the Torah. This was so that there would be no room for doubts in the authenticity of Moshe Rabbeinu’s nevuoh forever. But 40 days later, there is an egel hazahav. This is incredibly jarring. They achieved an unbelievable level of nevuoh and heard Hashem telling Moshe that avodo zoro is assur! How could they just ignore it? Let us read what the meforshim say about it. Moshe instructed Shevet Levi to arm themselves and execute those who worshipped the egel. How many people did they actually kill? The Torah says only 3,000 people—out of 600,000! So why were all of Klal Yisroel in danger of being wiped out and require Moshe to daven to spare them? 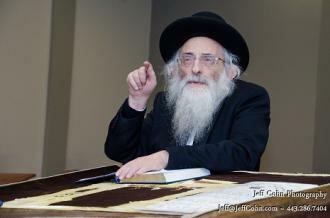 The meforshim say the real people behind making and worshipping the egel were the eirev rav. They hadn’t gone through the slavery and the process of geuloh as Klal Yisroel had. They weren’t involved in the educational program that Klal Yisroel went through with the ten makos and the korban Pesach. They were greatly impressed by the Jews and by Moshe and were overwhelmed by everything going on. They rushed to join them in their time of triumph without being internally prepared to take on the responsibilities of being the chosen nation of Hashem. So they got nervous when Moshe Rabbeinu didn’t come down and they confused Moshe with Hashem. So they made an egel for security. And Klal Yisroel are now doubtful of their own resolve. Hashem is very anxious to bring Klal Yisroel to Har Sinai. He presented them with absolute clarity about the reality of the world and the falsehood of avodo zoro. But the only ones who were really able to integrate all these lessons to the core of their being were Shevet Levi. The Rambam tells us that Levi was the first Rosh Yeshivah of Klal Yisroel. His shevet maintained their commitment to carrying on the mesorah of the Ovos throughout golus in Egypt. They were learning Torah while the others were volunteering for national service which ultimately led to their enslavement. They wanted nothing to do with Egyptian culture. They kept bris miloh proudly while others were trying to hide it in order to integrate with Egyptian society. Shevet Levi started on a higher level when the process of yetzias mitzrayim unfolded and then ended up higher at the end of it. They had no doubts and fears because they integrated everything gradually from the beginning. They were the only shevet completely unaffected by the eirev rav and the cheit ho’egel, while the others were confused. Hashem ultimately decided to forgive Klal Yisroel but refrained from bringing back the shechinoh to the level it once was. Klal Yisroel had to work themselves back up the ladder. They will eventually enter Eretz Yisroel, but it will be a huge nisayon. All this time, Klal Yisroel have been living an artificial existence on a supernatural plane. There is no need to be occupied with one’s physical needs and all there is to do is learn Torah. They see the shechinoh and nissim with them on a daily basis. Are they ready after only two years to live in a natural environment doing hishtadlus and not lose focus on the reality of ruchniyus? This is the lesson of parshas Behaalosecha. After they put up a mishkon and the shechinoh is with them, Hashem is ready to take them into Eretz Yisroel. They are moving on! But suddenly we turn away from ruchniyus and pursue taivoh for its own sake. It sets off a chain reaction where Klal Yisroel fall down and down till the cheit of the meraglim. Hashem saw that we were not ready to go into Eretz Yisroel. As the Mechiltah says, Hashem saw that they needed to stay in the Wilderness for another 38 years until the Torah will be absorbed into their blood and their bones. You must not get confused by avodo zoro and all the challenges of living in the outside world. So for forty years they had nothing to do but listen and review Moshe Rabbeinu’s shiur and grow in Torah. So how does one grow and develop that sensitivity and awareness of the reality of ruchniyus? And how do you maintain it? First you have to decide that I am going to accept it and put everything into it, and then you will see how sweet it is. But if you just want to try it out and see how you like it, with no commitment, then you will quickly find excuses to drop it when things get tough and inconvenient. What does it mean to be a Jew? All the mitzvos are a means to become a mamleches kohanim vegoy kodosh. We are a totally different nation, our very essence is different and our potential to connect to Hashem is unparalleled. We can never forget that we are Hashem’s treasured nation and He protects us as such. Even if we get a hisorerus to take on that complete commitment, how do we maintain that connection? We see over and over that Chazal see limud haTorah as the way our Ovos and Klal Yisroel kept their level after they achieved it. Limud Torah is not just a mitzvah out of many mitzvos. It is the glue which connects us to Hashem and keeps our identity constantly in our consciousness. Only then, after the Torah is absorbed into the very fabric of our being, can we be ready to venture into the outside world.